This is my latest quilted creation, a small wallhanging made for Dale and Joan to commemorate our trip to Alaska and the Yukon Territory, finished just in time to give to them for Christmas. That’s fitting, since it was during our Christmas visit last year that we started planning for that trip, picking the dates and the tour we wanted. 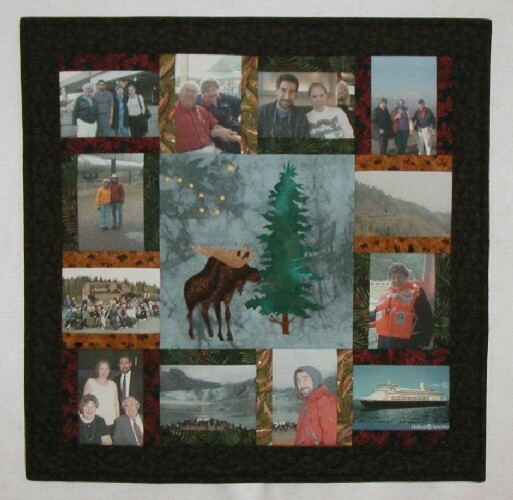 Mr. Karen assisted with the design, helping me choose pictures and decide which fabrics should go where and also came up with the idea to put the Big Dipper and the North Star in the otherwise blank section of the background to echo the Alaska state flag. 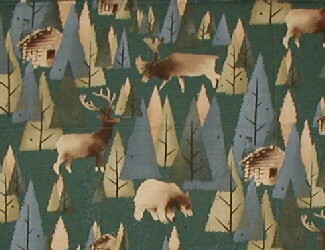 At first I planned to use a pattern for a paper-pieced moose block I’d bought on our trip for the center, but then I happened to get out of a customer meeting in time to stop at a quilt shop on the way home and saw a fusible applique pattern with a pine tree and a moose that I thought would be better (O Christmoose Tree by McKenna Ryan). To make the tree fit my plan, I had to remove a few inches of height from it by chopping out sections of both the top and the trunk, but the moose I used as is. The deer and the bear and the bunny and the Christmas lights didn’t fit my plan at all. That same shop also had the perfect fabric for the backing. In choosing the pictures, we tried to get a representative selection from both the land and sea portions of the trip. There’s our arrival at the airport in Anchorage, Dale and Joan on the train, Mr. Karen and me on the train, Joan and me and Dale with Denali, the train itself, Joan in her life vest on the verandah in their stateroom, the ship we sailed on (scanned from a postcard), Mr. Karen and the Johns Hopkins glacier, the bow of the ship and the same glacier, the picture we had taken on formal night on the cruise, the group shot from the bus portion of the tour, and me and Mr. Karen with the pipeline. 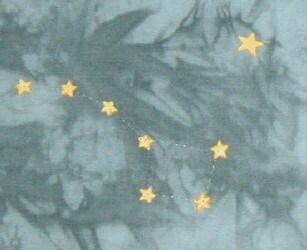 Once again, I used the Printed Treasures fabric in the inkjet printer and it worked beautifully. I’m going to have to order another box of it soon. 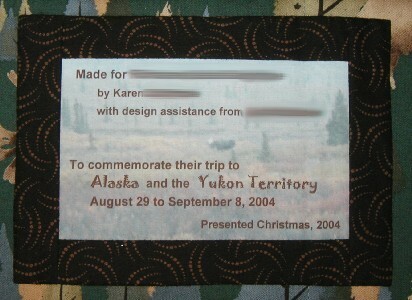 I used Printed Treasures for the label, too. The background is one of the fuzzy shots of a moose I took out the window of the bus in Denali National Park, lightened up so the text would show up. I was pleased as could be to find brown thread to finish the binding and label in the sewing table that used to belong to Mr. Karen’s grandmother. It’s always neat when I can pull out one of her wooden spools to use in a project, and particularly when it’s something for family. One year ago, I went to the quilt store with Joan. Two years ago, I wasjust back from Florida.